The name alone indicates how significant this new tire is for Schwalbe. It is the fastest and at the same time most reliable competition tire they have ever made. It is manufactured in a separate facility built exclusively for the production of this new top-class tire. hand-sewn tubular tire. But the future belongs to the modern tubeless version. In practice this system offers outstanding benefits. The rolling resistance is noticeably lower than with conventional folding and tubular tires because this system minimizes friction losses. 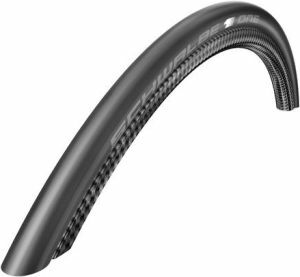 At the same time tubeless systems are extremely safe and a sudden loss of air is almost impossible. There are no longer any tubes that can overheat and burst. A puncture protection liquid seals punctures within tenths of a second.